Introducing the New & Improved, Patent Pending Aquaus 360° Diaper Sprayer with thumb pressure controls on both sides the sprayer. Thumb pressure controls allow you to easily adjust the spray pressure as you rinse messy cloth diapers, preventing splattering and overspray. 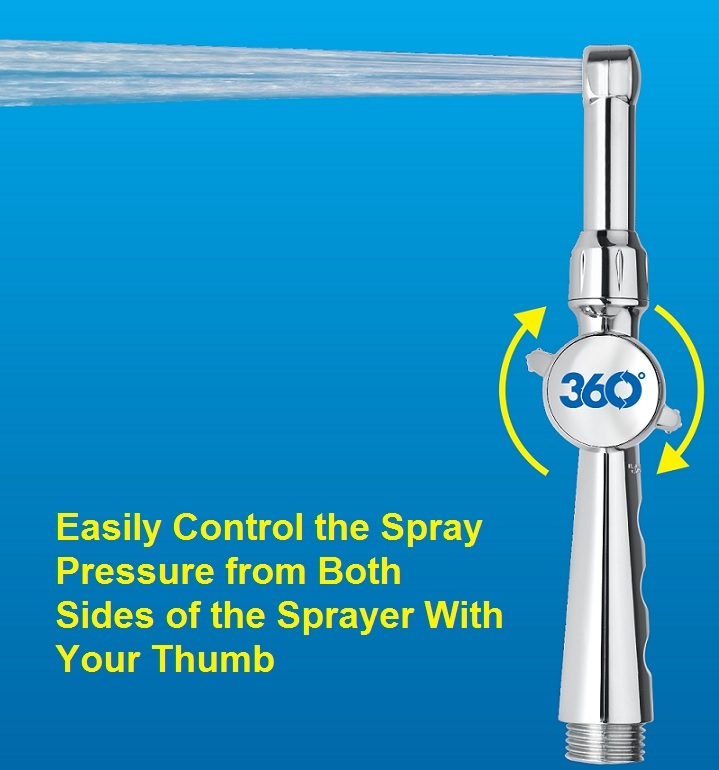 Spray pressure can also be set to any level while rinsing, making the sprayer very comfortable to hold and maneuver. Spray pattern is designed to easily rinse the messiest diapers with the greatest of ease. 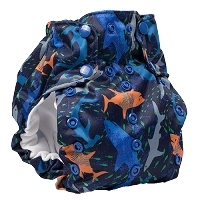 New Ergonomic Design Makes Rinsing Cloth Diapers Easy! 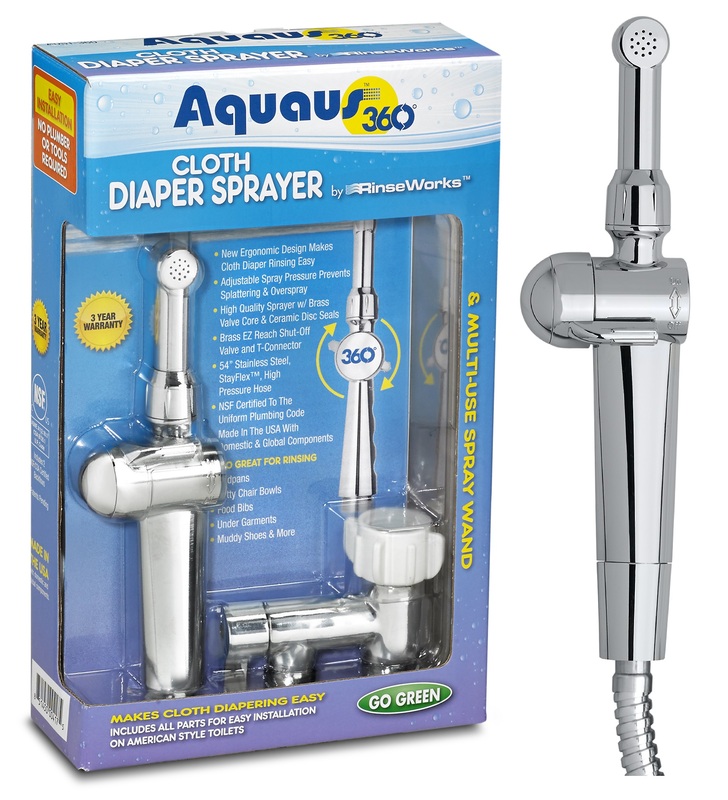 The Aquaus 360° Diaper Sprayer is Made in the USA with domestic and global components. Domestic production, testing, assembly and packaging ensures that you are receiving the highest quality products. 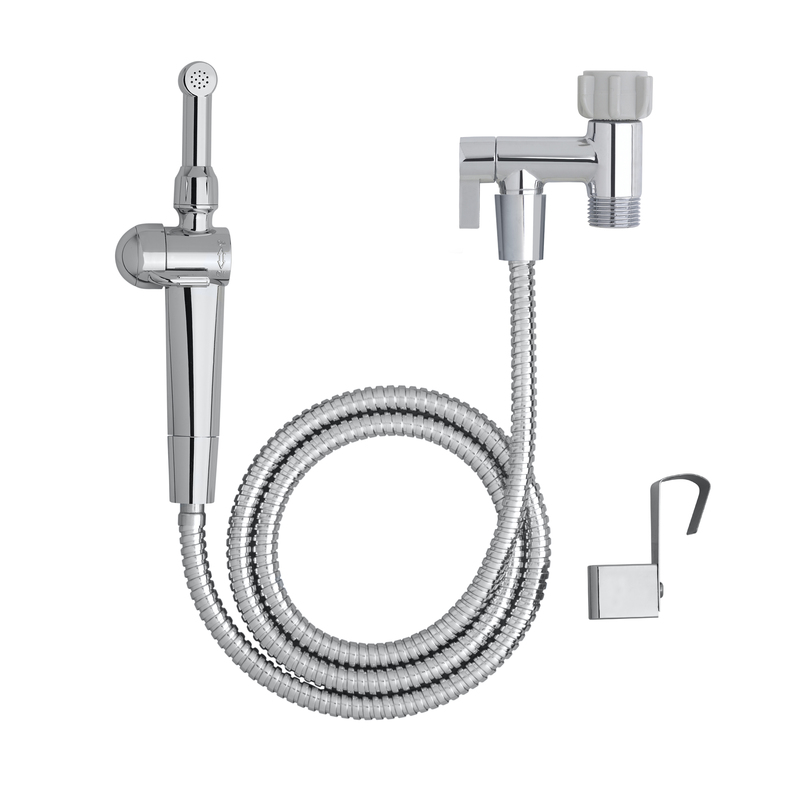 High quality plumbing code compliant components do cost a little more, but are well worth the additional amount knowing you’re installing the highest quality and most reliable plumbing products in your home. 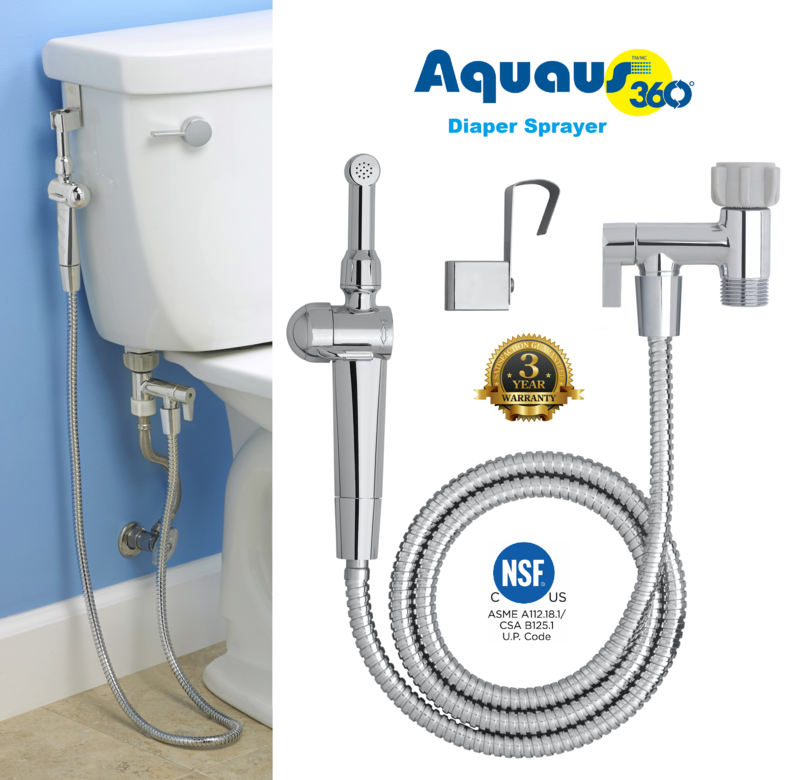 The Aquaus 360° is the ONLY Diaper Sprayer (hand held bidet / Shattaf) that is NSF Certified to U.P.C. (Uniform Plumbing Code) for installation in the USA & Canada and includes 2 Certified Plumbing Code Required Backflow Preventers. The Aquaus 360° Diaper Sprayer (Hand Held Bidet / Shattaf ) has a three (3) year warranty from the date of purchase to be free from defects or problems. To ensure the highest quality, all of RinseWorks’ products are assembled, tested and packaged in the USA ensuring that you are receiving the highest quality products. 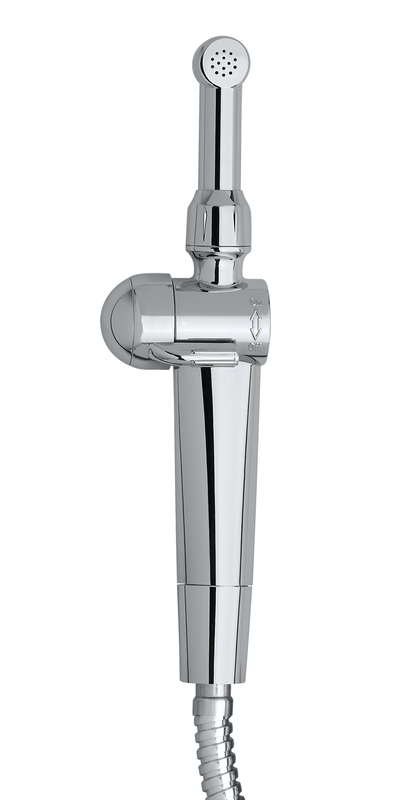 The New Aquaus 360° Diaper sprayer is made of high strength, impact resistant, corrosion free ABS polymers with a bacteria resistant polished chromed finish and a brass valve core with ceramic disk seals. 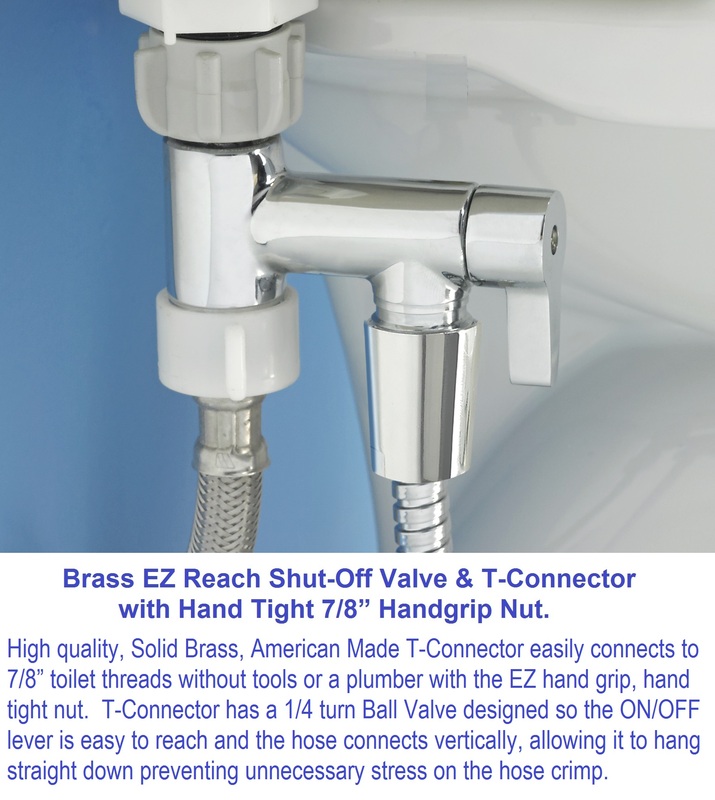 High Quality, Solid Brass, American Made T-Connector easily connects to 7/8” toilet threads without tools or a plumber with the EZ hand-grip, hand tight nut. T-Connector has a 1/4 turn Ball Valve designed so the ON/OFF lever is easy to reach and the sprayer hose connects vertically, allowing it to hang straight down preventing unnecessary stress on the hose crimp. 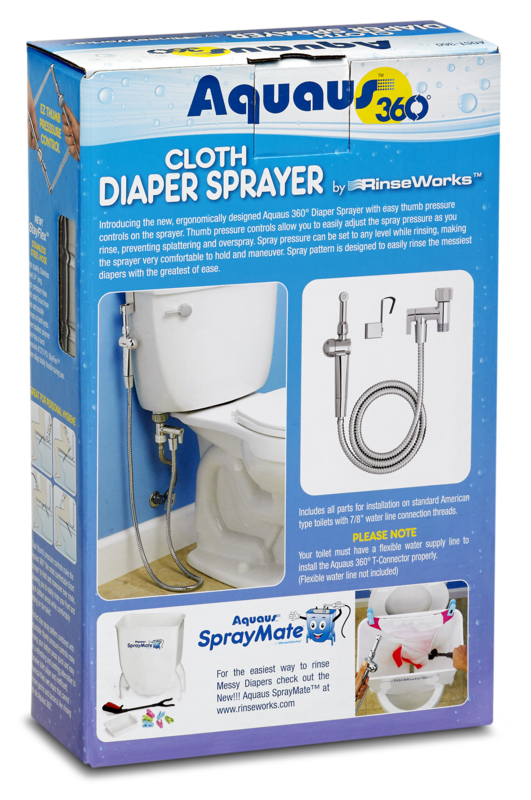 The Aquaus 360° Diaper Sprayer (Hand Held Bidet / Shattaf) includes our NSF Certified, StayFlex™ 54? long, stainless steel, high-pressure spray hose with a burst rating of 270 psi. StayFlex hose design includes double hose crimps on both ends and a high-pressure braided polymer inner hose. The state-of-the-art design allows the StayFlex hose to stay completely flexible when pressurized. Hose diameter is only 11mm, making it less noticeable and easier to maneuver. The Aquaus 360° Diaper Sprayer adjustable pressure controls make precision rinsing super easy by allowing you to spray a small stream of water to locate the target area, then gently increase the spray pressure preventing splattering and overspray. The Aquaus 360° spray pattern is also the perfect size and shape for easily rinsing the messiest diapers. The Aquaus 360° Diaper Sprayer is not only perfect for rinsing messy cloth diapers, it is also great for personal hygiene and rinsing and cleaning the toilet after you go. 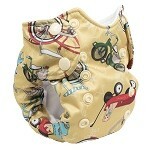 Or, for rinsing bedpans, potty seat bowls, under garments, food bibs, muddy shoes and many more of life’s messy moments. The Aquaus 360° Diaper Sprayer (Hand Held Bidet / Shattaf) simple installation does not require tools or a plumber and offers several mounting options for the sprayer. Why use disposable diapers when you can easily rinse reusable cloth diapers with the Aquaus 360° Diaper Sprayer then toss them in the washing machine. The average baby will use over $1,500.00 per year in disposable diapers. Plus, with Cloth Diapers you never run out of diapers! Please note:Your toilet needs to have a flexible water supply line to install the Aquaus toilet adapter correctly.